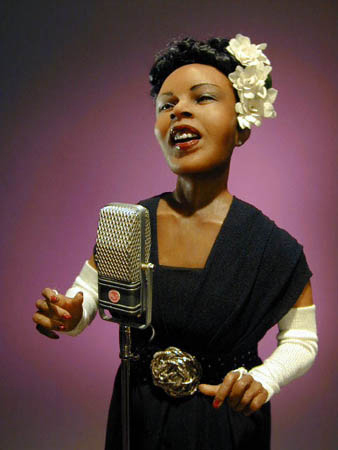 Our Tribute to the one and only 'Lady Day' .. Fully sculpted in Quality Polymer Clay and entirely hand painted. Billie stands approx. 16" tall. Her trademark 'Gardenias' are hand cut from vintage cloth flower blossoms. Her micraphone is hand made from brass and wood.